Up to this point in time, the ‘warrior-scholar’ was perhaps best exemplified by the German General Heinz Guderian whose writings about the use of mobile mass tank formations in battle provided an innovation from the largely static trench-warfare fought during the First World War. The experience of colonial wars produced military theoreticians in the art of counter-insurgency such as Roger Trinquier and David Galula, both French officers, the former who served during the First Indochina War and the Algerian War and the later in Algeria. British military officers have also made significant contributions to the development of counter-insurgency techniques. This is not surprising giving over two centuries of imperial policing and combating revolutionary movements. Robert Thompson’s experience of the counter-insurgency effort in Malaya provided a theoretical template geared towards defeating the Maoist technique of rural guerrilla insurgency. Frank Kitson, whose soldiering career developed during the waning years of empire is another such figure. 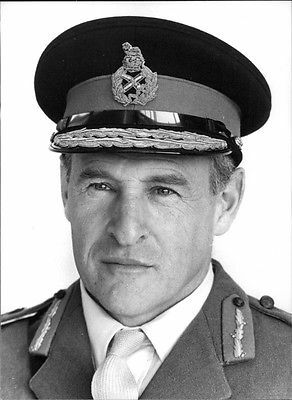 He served in Malaya, Kenya, Aden and Northern Ireland, and is theories have alongside Thompson’s become the official counter-insurgency doctrine of the British Army. In order to put an insurgency campaign down, one must use a mix of measures and it is sometimes necessary to do unpleasant things which lose a certain amount of allegiance for a moment in order to produce your overall results. Kitson’s response was to assert that he was only a commander of troops and not a policymaker. He made no specific references to his experiences in Northern Ireland in his 1977 book Bunch of Five, a military autobiography, given the sensitivity associated with a still ongoing conflict. MRF organisational records have been destroyed and while there may be a temptation to portray Frank Kitson as have been merely the spiritus rector of early and later techniques employed in the counter-insurgency, there is ample evidence pointing to Kitson as having been the architect of the overall policy as well as the specific creator of the MRF. 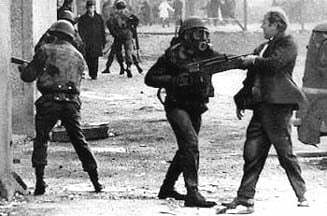 For some time,” said Carver, “various surveillance operations by soldiers in plain clothes had been in train, initiated by Frank Kitson when he commanded the (39) Brigade in Belfast, some of them exploiting ex-members or supporters of the IRA. Kitson’s philosophy and activities in Northern Ireland is also important to consider in the context of Britain at the time. This is because he believed that there was a strong possibility that the breakdown in law and order in Northern Ireland could be mirrored in the rest Britain and that the tactics employed there would be required on the mainland. England was no longer a green and pleasant land and the possibility existed that unpleasant measures of the sort advocated by Kitson might need to be put into effect. While the ending of the conflict in Northern Ireland, starting with the declaration by the IRA in 1994 of a “complete ceasefire”, is characterised by sympathizers of the Republican movement as a statemate followed by political compromise, the fact that the IRA’s demands for the complete withdrawal of British troops and the reunification of Ireland was not accomplished is interpreted by British military figures as a victory of the British state. If this view is accepted, it vindicates Kitson’s methods. But at what cost? It is a curious but noteworthy fact that many military theorists and practitioners of counter-insurgency warfare who hailed from democracies such as Britain and France did not shirk from developing brutal strategies aimed at defeating insurgencies. As Kitson wrote, what he described as the “more intelligent officers” find themselves developing a new “deviousness” in terms of outwitting what often turn out to be determined and resourceful foes “by all means”. Many of the French officers with experience of the conflicts in Indochina and Algeria became adept in the conduct of so-called psychological operations. A number of them, including Colonel Jean Gardes went on to become members of the Organisation de l’Armee Secrete (OAS) after which fleeing to exile, they came to serve as trainers and advisors to the Argentinean military officers who conducted the ‘dirty war’ against Marxist guerrillas in the 1970s and 80s. One of Colonel Roger Trinquier’s prerequisites for fighting an anti-guerrilla campaign was the use of terror and torture as necessary evils. The counter-insurgency doctrine of the United States as implemented during the Vietnam War, Central America and then Iraq has also revealed a rich underbelly of amoral strategies that have left in their wake a recurring pattern of serious human rights violations including murder and torture.